Q- Tells something about yourself and your job. A- I'm Dessima Surender. I'm a coconut-tree-climbing, sun-loving girl from the tiny Caribbean island called Grenada. What I do, as in work? Absolutely nothing. I am a bit lazy. My husband goes to work so he can buy me food and nail polish. I stay home and paint my nails. I'm a woman of leisure. Q-What got you into nailart? Tell something about your journey? A- I needed an antidepressant, and it came in the form of glitter, polish and shine! I have had many negative remarks about my pictures. But when I look at all the positive responses and the wonderful feeling I get once my nails are done, smiles and happiness prevail. 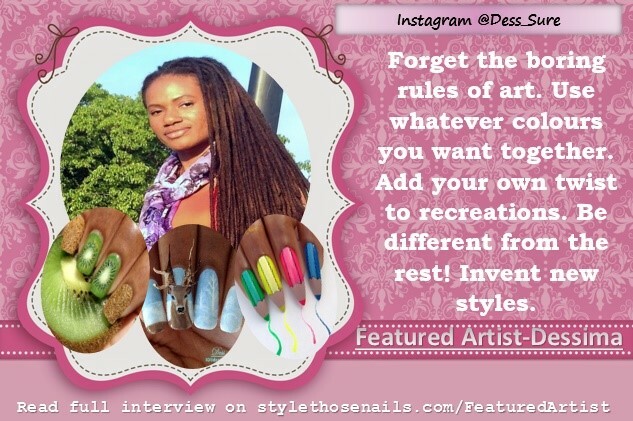 Q- What is your favourite style of nailart? What are your future goals? A- I gravitate towards artwork which is unusual, creative and fun! I love being crafty so I include things which are not normally used in nail art, like sewing thread, twigs, dried fruit and what ever insect wings I find. As I improve, I hope that one day, my art can be appreciated by a larger audience, as little bits of sunshine, brightening the world one brush stroke at a time. Q- What tricks tips and advise you will give to your fellow nailartists and beginner? A- Forget the boring rules of art. Use whatever colours you want together. Add your own twist to recreations. Be different from the rest! Invent new styles. 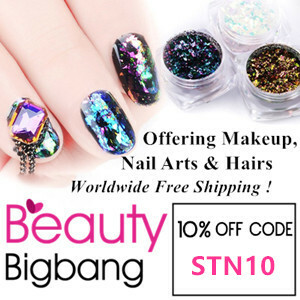 Do not get stuck doing one type of nail-art or using one particular technique. Explore and try everything.